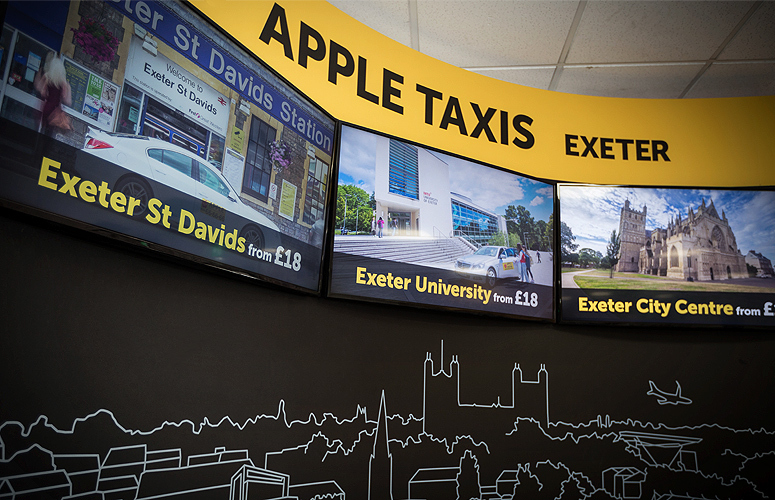 Apple Taxis - Fruition | Digital Signage and Interior Refit for Exeter Taxi Co.
Apple Taxis are one of the biggest taxi companies in the South West with a fleet of over 250 vehicles transporting hundreds of customers on a daily basis. 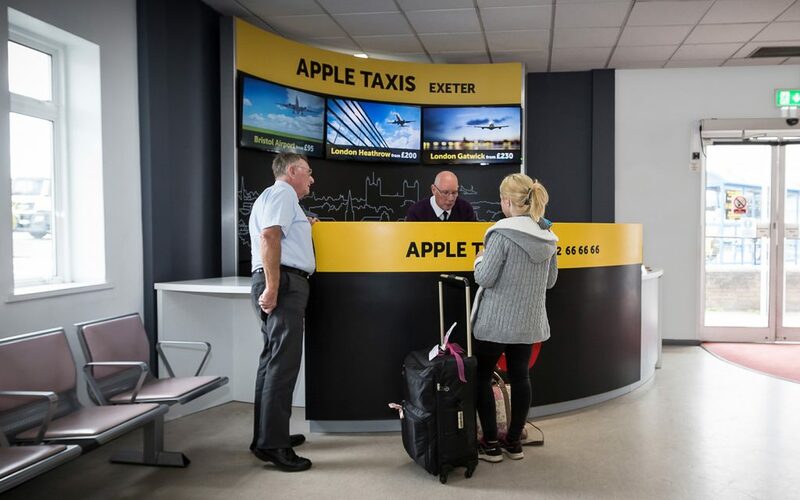 The renovation and redesign of the booking desk at Exeter International Airport is part of the continued investment and improvement of passenger facilities. Situated on the land side of the arrival hall and in direct view of oncoming passengers they will now be presented with a modern and confident taxi service. The colour scheme and typography were selected to emulate the existing airport wayfinding system which will be familiar to passengers. 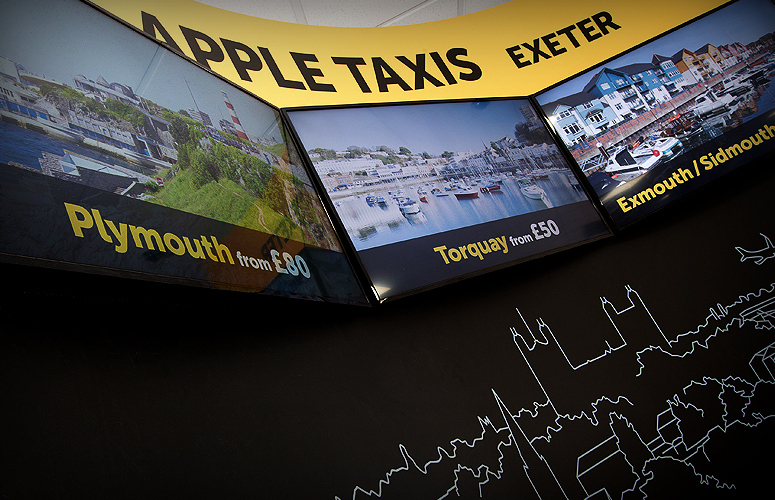 We are delighted with our new look taxi desk in the arrivals hall at Exeter. The Fruition team provided a wonderful service from design stage to installation. The desk has revitalised our airport service and made us much more approachable to customers. The digital signage display provides key information and minimises queuing at busy times. The high quality finish of the completed desk will look great for years to come. 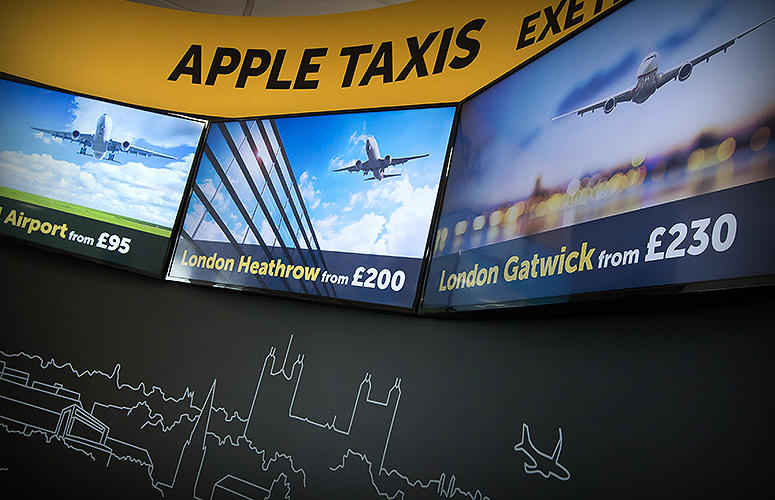 As part of the scheme we installed three digital signage screens that will allow Apple Taxi’s to program offers to match the arrival of specific flights or events in the area. Popular local destinations such as the Exeter Chiefs rugby ground and the University of Exeter can be displayed as fixed cost offers and updated remotely. A styled illustration depicting the Exeter city skyline is situated below the screens, continuing a theme used in our design of the Executive Lounge at the airport. Those familiar with the area will recognise the Cathedral, rugby ground and other distinctive landmarks. The desk can be run by one or two Apple taxi’s staff, with simple back of house facilities hidden behind the curved screen. The new desk also discreetly incorporates a section of counter to accommodate wheel chairs. Interested in Digital Signage for your business? Visit our dedicated page to find out more.